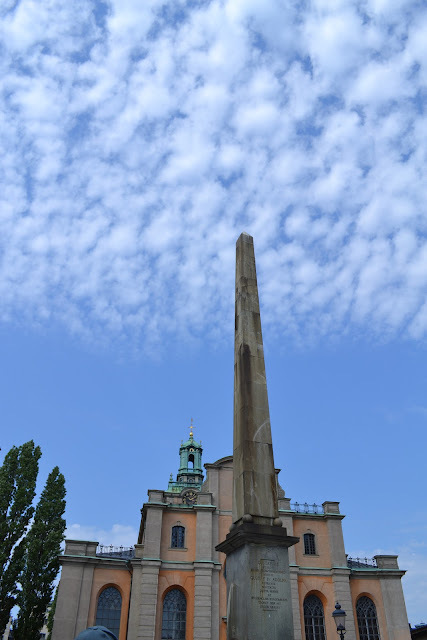 After Estonia, we embarked on our trip to Stockholm, Sweden. On the bus en route to Stockholm, I was amazed at the vast open lands in Sweden's country side. There were so many trees, farms, mountains, grazing horses on the hills and the road to the city was littered with beautiful purple flowers. All I could think of was getting off the bus to pick up wildflowers. I was impressed at how naturally beautiful the country side is. I told myself that next time, I'll plan on visiting the country side of Sweden. For now, Stockholm will do. At about 9 am, we approached the island of Stadsholmen and the medieval town of Gamla Stan (Old Town) stood there waiting to be explored. Gamla Stan emerged in the 13th century and is home to Sweden's Royal Palace. This Royal Palace is one of the largest inhabited palaces in the world with over 600 rooms. In addition to the reception rooms, there are several interesting museums in the Palace, including the Royal Armory, with royal costumes and armor. I love these iconic buildings at Gamla Stan's Stortorget (The Big Square). It was one beautiful day in Stockholm - not a cloud in the sky. Viking runes at one of the streets in Gamla Stan. Mårten Trotzigs gränd or Alley of Mårten Trotzig is less than a meter wide with 36 steps down. 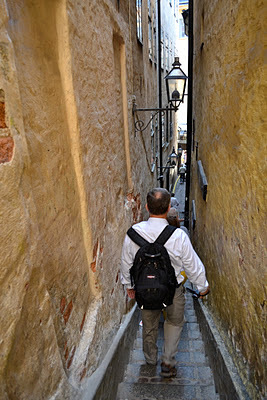 It is the narrowest alley in the city. The harbour of Skeppsbron, the eastern waterfront of Gamla stan. 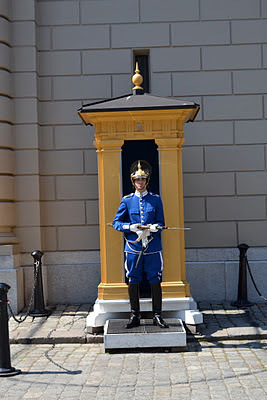 Luckily, we were in time to watch the ceremonial changing of the guards at the Royal Palace. Stockholm looks very, very beautiful. Wow I cannot believe you've already had snow. Incredible! We did have grey skies and rain here today so it's finally in keeping with the season. Your photos are amazing. I have been there and on't have any photos so clear and beautiful. Thanks for the memories! I love those colorful buildings too. Your camera must have had it's exercise. Your pictures are really beautiful, and I enjoy the history that comes with your post.